This “first rack” 345 was recently on Ebay and it was right in my wheelhouse. It’s almost Halloween and time to do something scary. What shall we do…haunted house? Scary carved pumpkins? Norlin Gibsons? How about a post on how to adjust a sideways trem? That’s plenty scary. But, no, let’s talk about Ebay scams. The potential loss of around $13000 ought to get your attention. 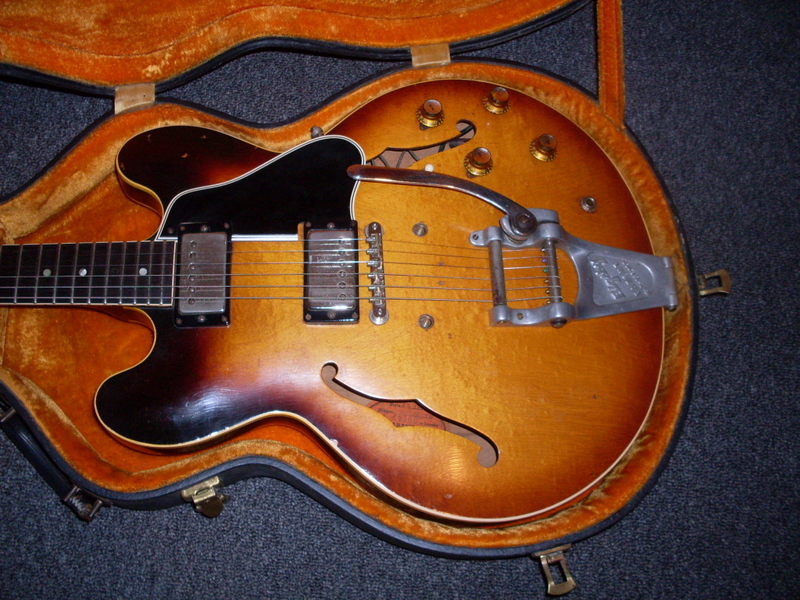 Recently, I was the high bidder on a 1959 ES-345 on Ebay. 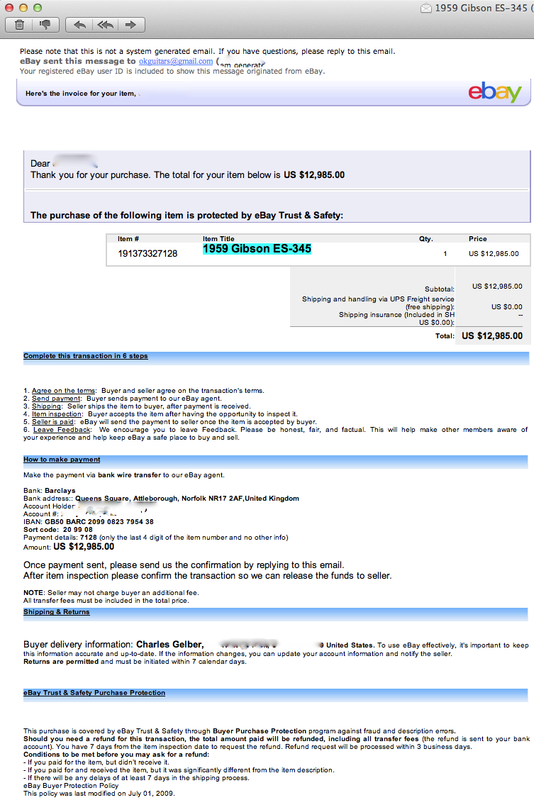 There were red flags from the get go but I consider myself to be be relatively savvy when it comes to spotting a scam. The seller had a zero feedback rating. That, in and of itself, does not scare me at all. I’ve bought at least 3 or 4 guitars from zero feedback sellers without issue. I’ve also bid on a few that turned out to be scams but I only lost money once and learned a valuable lesson from that experience. The guitar appeared to be a “first rack” 345 which are very desirable among 345 aficionados and players alike. They usually have huge necks and often have double white or zebra PAF’s. The photos looked good and the description was credible so I saw no reason not to bid on it. Here’s a link. Ebay has made it a lot less scary by doing something they should have done from day one: Guarantee the sale to be legit. Now, if you pay using Paypal, they do just that and they should. After all, they collect almost 3% on every transaction. They make a boatload of money and the least they can do is offer some protection and they do. Good for them. That makes it a little less scary. So, I win the auction and set up to pay using Paypal. I had sent the seller an message on Ebay asking if we could ship it using my Fedex account and included my email address so we could correspond outside of Ebay. Then it started. Cue the scary music. “Can you pay me by bank wire? I don’t take Paypal.” The email even included links to sites like Paypalsucks and IhatePaypal or some such silliness. I pay by wire all the time but I also knew that Ebay won’t protect me if I do that. So, I emailed back and said I needed more proof that the seller has the guitar in hand before I send a wire. I got a few more photos but they were clearly from the same batch of photos that appeared on Ebay. I wanted some new ones and maybe a “hostage” photo (A photo with today’s newspaper). “Sorry, I’m traveling in the UK and I don’t have access to the guitar right now…” More scary music goes here. Then I get another email that looks just like an Ebay invoice with the bank wire information on it. There were two problems with that email. One, Ebay doesn’t send invoices with bank wire information on them and two, the headers showed that the email came from somewhere other than Ebay. What? More scary music? I explained to the seller that I’d usually be happy to send a wire but that the zero feedback and lack of new photos was causing me some concern. So, what does the seller do? He (or she) mocks up a new feedback page showing 1300 positives. All the sales were for video game supplies and none were guitar related. That’s another red flag. Seller had also changed the user name slightly which I probably wasn’t supposed to notice. It’s kind of funny how the once very polite seller starts getting indignant at this point. How dare I impugn his honesty (gasp). So, I got on the phone to Ebay customer service (8 minutes on hold-not that scary) and explained the situation to someone-probably in Bangalore but at least it was a human being. Don’t get me started on outsourcing American jobs. Ebay said “Why don’t you just pay using Paypal?” When I fully explained the email trail, they transferred me to another department and they were very helpful-explaining that Ebay doesn’t send invoices outside of Ebay messages and that they would never include bank wire information. So, the lesson here is simple. If something seems too good to be true, don’t immediately assume it is not true. But make damn sure it is true before you send any money no matter what the feedback. Google the seller. Make sure he exists in the location he says the item is located. Call the bank and explain the situation to them if you still aren’t sure. Use Paypal when you can-you aren’t paying the fees, the seller is and their protection program actually works. There’s some red tape but at least you have some recourse. Send a wire and you are out of luck if the item never shows up. And don’t expect much out of the local police if it ever comes to that. I have a long ugly story I can tell about that. This is what I got in the email with some redactions. Looks legit but it isn’t. Ebay never includes wire information. OK, so I covered the usual stuff-refinishes, repairs, holes and changed parts. Most of you probably knew most of what I pointed out. But there are other elements that can put a guitar into the bargain bin that aren’t as obvious. Re-necks are not uncommon and when done correctly can give you a guitar every bit as good as an original at around half the price. I have two good examples of this. One was a 61 dot neck that I bought that had a bad neck break. Everything else was pretty much stock; the repair was ugly but stable on the typically flat profile neck. I sold the guitar as is and the next buyer had a luthier make a new neck for it using the 59 profile which is, of course, much more popular these days. In fact, the only reason a 60 or 61 costs any less than a 59 is the neck. Everything else is pretty much the same unless you want to talk about short magnets (mid to late 61) vs long magnets. I took back the 61 with its new neck in trade and sold it for about half the price of an equivalent big neck dot marker 335. I think that was a pretty good score. The buyer got the equivalent of a 59 dot for the price of a renecked 61. Great player too. The other example was a 64 that was done at Gibson a few years ago It was re-necked when I got it using the Memphis fat neck. To be honest, I don’t like that particular profile-the shoulders are way too big and the neck feels clunky to me. But, plenty of players love it and that neck on a 64 was pretty appealing especially at half the price. In the first case the buyer saved around $10,000 and in the second, around $7000. Each one played and sounded like a completely stock vintage guitar. Another way to save a bunch of money requires a bit more of a leap of faith. These guitars are not broken, refinished nor do they have changed parts. They are guitars that have altered serial numbers. This sends up a big fat red flag to many buyers because most guitars with altered serial numbers have probably been stolen at some point. I’m not going to make a moral judgement here because there are factors that you just cannot know. 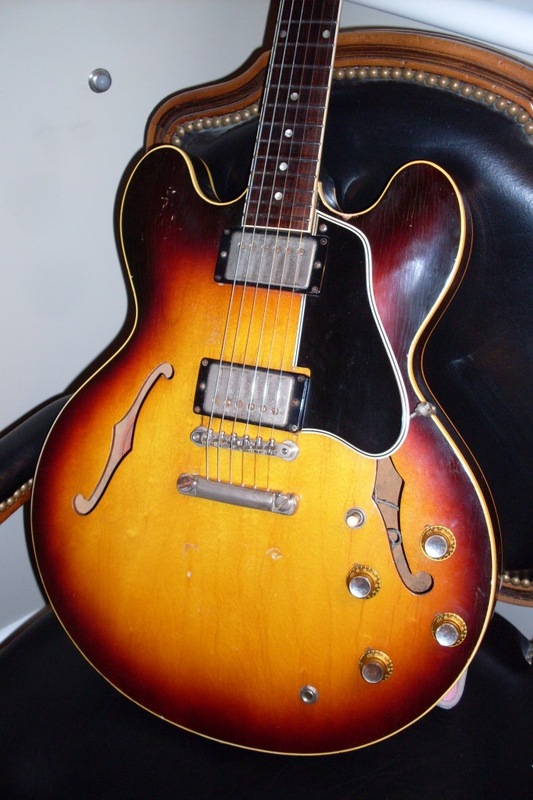 For example, I bought a 64 ES-335 (the one in the photo in the last post) from a Canadian gentleman who bought the guitar used (from a music store) in 1966 and the serial number was partially defaced when he got it. It may have been stolen or it may have been altered to avoid Customs in some way. But he had the guitar for nearly 50 years and I had no doubt that he was telling the truth about its origin. That guitar sold at a very large discount. The only problem will be when the current owner is ready to sell it and he has to make all the same explanations I had to make. It makes it harder to sell for sure and it pretty much kills any collector value. I have a 60 right now that has black marker inside the f-holes and a repro label. That could mean that someone was trying to cover the serial and the FON. Or not. I’ve seen black paint in the f-holes a few times over the years with the serial number fully intact. Most thieves aren’t even aware that there is a FON in there. Many owners don’t even know about it. I’ve also seen plenty of ES’s that the label has fallen out of. It still calls the guitar into question and that question has to be priced in. It is worth noting that the seller wasn’t aware that the label was a repro and I considered returning it because of that. But it’s a great guitar and you just price it into the mix. It’s a slippery slope for sure and I’m always more than a little hesitant to accept any guitar that has a serial number issue. One more road into the bargain bin and that is excessive wear. The Fender people are at an advantage here because their guitars are solid and bolt together. An abused, road hard and put away wet ES-335 can have all sorts of hidden issues like deteriorated glue and delamination. As long as the guitar isn’t literally falling apart, excessive wear shouldn’t affect the tone or, as long as the frets, the nut and the bridge are good, the playability. I don’t like a lot of neck wear but some folks aren’t bothered by it. Just make sure the neck isn’t twisted or backbowed and that the top or back isn’t separating from the sides. Oh, and look at the neck join. There should be no space between the heel and the body. The lacquer may be broken but no gaps. A true beater can play like a dream and save you $5000-$10000 on a high end 335 from 58 to 64. This 61 dot was played hard and was pretty beat up but it sold for under $12K. Still, it had no issues other than wear and two tiny mystery holes behind the tailpiece. 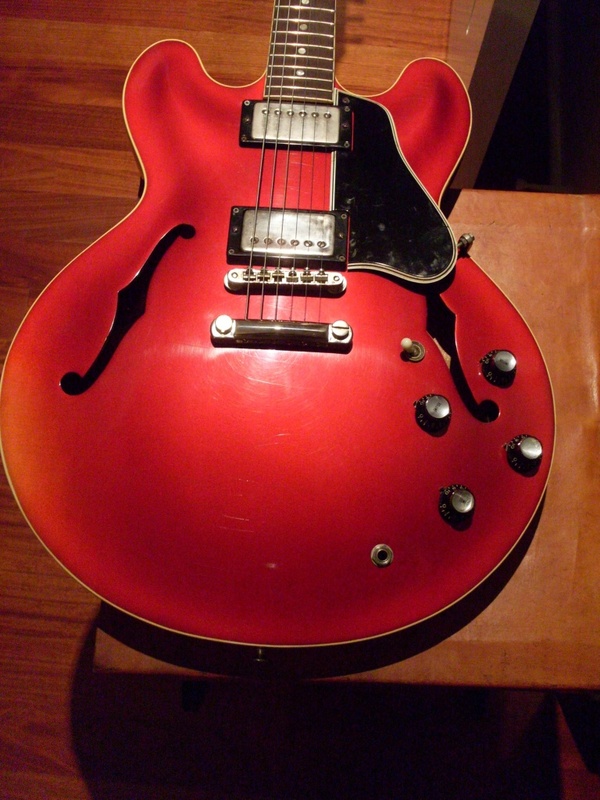 This candy apple red dot neck 62 is still one of the best playing 335’s I’ve ever had. Top five for sure out of around 400 of ’em. You could probably find one for around $10K if you’re patient. If I’m recalling correctly, it had no other issues other than the refinish-maybe a changed part or two. There are a few ways-some obvious and some not so obvious. Some will get you a great player but a lousy investment (which is sometimes just fine). Some will get you a beat up piece of crap that sounds and plays horribly. The key word here is “player”. “Player” doesn’t mean a piece of crap. It means just what it says and that infers a guitar you can actually play (and sound good doing so). Typically, when a guitar goes up for sale in a public marketplace like Ebay or Craigslist, the seller describes it in such a way as to get you to buy it. That often means not disclosing stuff that will stop you from doing so. The lie of omission is rampant so ask a lot of questions. If the seller doesn’t know the answer, get lots of photos and prepare to pass on the guitar. There are certain issues that drop the price drastically and most of you are probably aware of them. The good news is that many of them have nothing-and I mean nothing-to do with how the guitar plays or sounds. The best way to get a great guitar for cheap is to buy one thats been refinished. That generally cuts the price in half and, unless somebody dumps a vat of poly on the guitar, has little or no effect on the tone. A bad refinish sounds the same as a good one most of the time. You can argue that poly finishes don’t “breathe” and affect the tone of the guitar. I’ll stay out of that for now. Also, I almost never see poly finishes on refinished 335’s. The next big price cutter is a repair. Any repair. Headstock breaks are good for 50% off in most cases and are often stable and a non issue. I would suggest that you get a lot of photos and show them to your local luthier because a bad repair will affect the playability and possibly the tone of your prospective purchase. The little “smile” crack that is typical is not generally that big an issue. They are relatively easy to repair and often completely stable. You know-the old “glue is stronger than the wood” theory. A headstock that has been broken off and reattached requires a little more scrutiny. I stay away from them but some are quite stable. The best repair? If you can get a good enough deal, get a guitar with a repaired hole somewhere. I recently got a great player for a great price because it had a repaired hole from a mini switch. I also had a dot neck a while back that had a small repair under the pick guard that was as good a player as any $40000 dot. Unless you pulled the guard, it looked just as good, too. It probably saved the buyer $10000 or more. Tuner holes and removed Bigsby holes can save you thousands and don’t affect anything. Changed tuners don’t have much to do with tone and often are an improvement in tuning stability (another story). These are the obvious ones but there are other things that can save you a ton but might not make you happy. Changed parts are a good way to save a buck and you can always replace them when you feel like it down the road. A repro ABR-1 sounds the same as an original. A Tone Pros or other aftermarket bridge might sound even better. A repro tailpiece will make no difference in tone nor will changed tuners. Knobs and other plastic is strictly cosmetic but they still can have a big effect on the price. It’s pretty easy to negotiate $1000 off a 58-60 missing its long guard because everybody knows that $1000 is about what they cost. Missing PAFs should really knock down the price of an early example but expect to pay $4000 or more to replace them if you don’t like the pickups that are in the guitar. Most folks don’t care much if a guitar has a vintage correct bridge, tailpiece or plastic as opposed to the actual originals. You couldn’t possibly prove they weren’t original unless the wear patterns are wildly different between components (again, another story). But when the pickups are replaced and the solder broken, folks get concerned. Again, a broken solder joint won’t affect the tone or the playability but it will affect the investment value of the guitar. But you wanted a player, so don’t worry about the investment value. Next, we’ll look at some things to avoid and some not so obvious ways to save a buck or two. This all original 64 stop tail was a big bargain. No changed parts, no refinish, no breaks. I’ll tell you why next post. 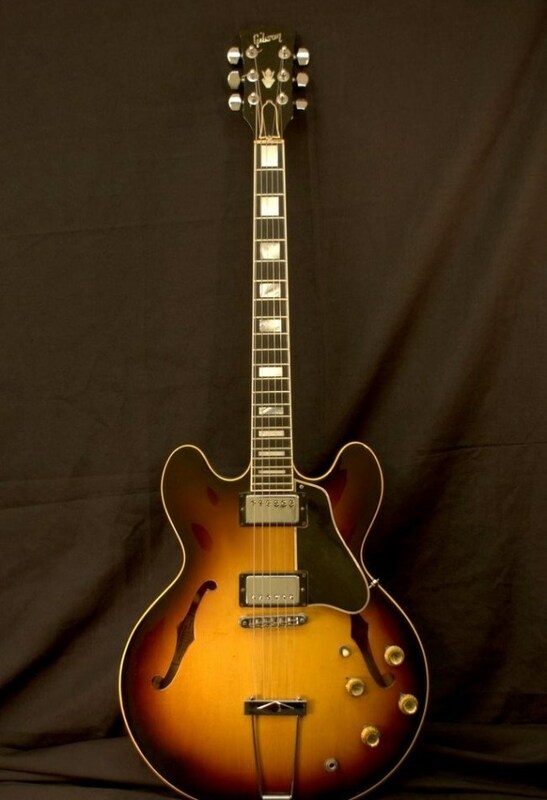 This is a 60 ES-335 with what is purported to be a factory installed ES-345 board. Very cool. I wish I owned it. We all know that a dot neck has a dot marker fingerboard, a block neck has little blocks, a 345 has parallelograms (yes, I can spell) and a 355 has big blocks. But supposing someone wanted a 335 with parallelograms or a 345 with dots? Is that something Gibson would do? Or even farther out of the box, say Super 400 markers on a 335? Maybe an ebony fingerboard on a 335? I’ve always said that anything was possible at Gibson during the “Golden Era” and that leaves some wiggle room for anomalies like this. 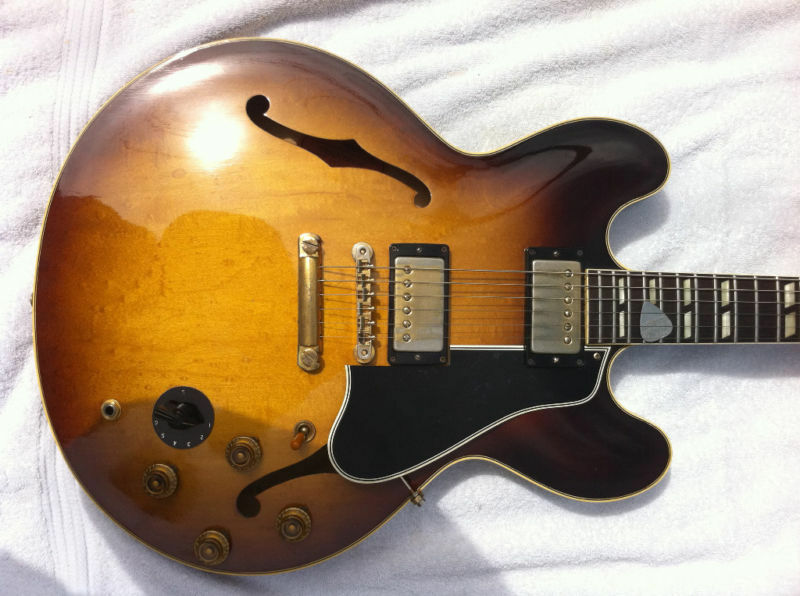 It is fairly well known that some owners were upset when Gibson changed from dots to blocks in 1962. No one knows how many dots were returned to Gibson to be “upgraded” to blocks but I’ve seen a few. The serial numbers were pretty reliable during the dot neck era so if you see a block neck with a 58-61 serial number, you can be pretty certain that it was redone at the factory. 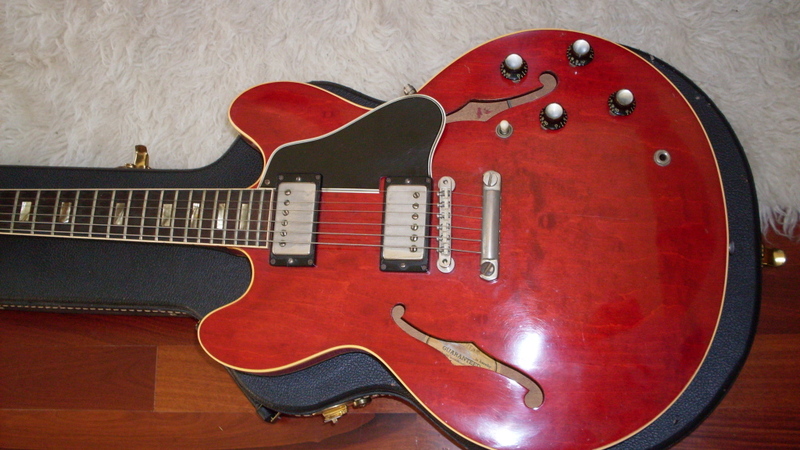 Here’s a 68 ES-335 with a 355 board. I’ve never seen it in person so I don’t know if its an ebony board or just big 355 inlays. Probably a factory one off. But what about other fingerboard anomalies? When I’m confronted with one of these oddities, I always assume at the outset that it didn’t come from the factory that way. After all, it isn’t that hard to change a fingerboard. It isn’t easy, either but plenty of luthiers can do it properly. But some are definitely factory one offs. The trick is knowing how to tell a factory custom board from one that was changed later. We are fortunate that some pages of the Gibson logs still exist (although Gibson isn’t real good about making them public). They were pretty good about noting special orders in 59 and 60 but by 61 there seems to be less documentation, so the best method is to look closely for anything that might suggest that the original fingerboard was removed and get in there with a magnifying glass or a camera with a macro lens. The camera will always see stuff that you can’t see with the naked eye. You are looking for breaks in the lacquer between the binding and the neck itself. You are looking for excess glue where it doesn’t belong. If the fit isn’t perfect, it was probably added later. Factory boards tend to fit pretty much dead on. So, what’s out there? I’ve seen a few 335’s with a 345 board. How do I know it isn’t a 345 with no Varitone? The body bindings are multi-ply rather than single and the hardware is gold. How about a 345 with a dot board? I was recently told by a fellow dealer that he had one and that it looked legit. I’ve never seen one but I couldn’t deny its possible existence. He’s promised me a photo. I have seen a 355 with a Super 400 board but I can’t find the photo. Gruhn Guitars had a ’62 335 with bowtie inlays (like a Kessel Custom) not too long ago but I’m pretty sure it was done somewhere other than the Gibson factory. It’s all part of the fun of Gibsons from the 50’s and 60’s. The truth is that you can find almost anything because if Gibson didn’t offer an ES–335 with a Varitone and an ebony dot fingerboard with factory Grover Imperials, somebody probably wanted one at some point and had Gibson make one up just for them. And if Gibson wouldn’t do it, there is always somebody who will. One further point. I’ve been asked what these rarities are worth and it is a very good question (and up for debate). We all should know that rarity and price are not directly proportional. That’s why a 62 Byrdland in blond (10 made) isn’t worth more than a ‘burst. Or a sunburst 62 ES-335 for that matter. There just isn’t much demand. I think one offs are great but they tend to ask more questions than they answer. No one wants to explain why their collectible guitar doesn’t follow the “rules” because, unless they have factory documentation, it will always be questioned by collectors. Even with factory docs, most collectors want a bone stock classic-not a one off. My opinion? Much as I like the 345 and 355 inlays, I’d rather have a stock 335. I don’t think I’d be willing to pay a premium for a custom board on any 335, 345 or 355. Still, that blonde with the 345 board is awfully cool. This 62 has bowties like a Kessel Custom. I can’t tell if it’s factory or not. I’m guessing not. It also has a bound headstock.